I have been on an intense personal development journey over the last year to transform myself from a negative complainer to a more positive person. I’ve always envied the people that seemed to be naturally positive. I’m naturally kind of a downer and managing clinical depression on top of that doesn’t help. I decided I was tired of my negativity and I felt like it was only making my life worse. I embarked on a quest to stop being a complainer and it’s been hard but completely worth wild. Here are some of the things I have learned on my no complaining quest. If you’re interested in this topic be sure to check out my podcast episode on positivity. If you complain all the time the people around you will reflect that back at you. Misery loves company and if you’re being negative chances are the people you are talking to will join in. Try and compliment someone or tell them what you’re excited about. Instead of making small talk about how terrible the weather is, talk about how happy you are that it was nice out last weekend. When you start focusing on positive things you will find yourself engaging in less negative conversations. I used to make conversations by complaining about random things and I didn’t even realize I was doing it. Not only was I bringing my own energy down I was spreading negative energy to everyone around me. I decided I wanted other people to feel good after having a conversation with me and not leave feeling depleted and down. Think about how your complaining effects other people and become aware of the impact that you’re having. If you’re complaining that means someone else has to listen to it and you’re bringing them down with you. The truth is we never know what anyone else is going through or what their struggles are. It’s easy to make quick judgments about people and then spread them around. Start training your brain to become more open-minded and stop criticizing other people. It’s hard to become a positive person that spreads good energy when you’re judging other people. If you don’t like what someone is wearing or how they do certain things keep that to yourself. When you find yourself making judgments try to find something good about that person instead. 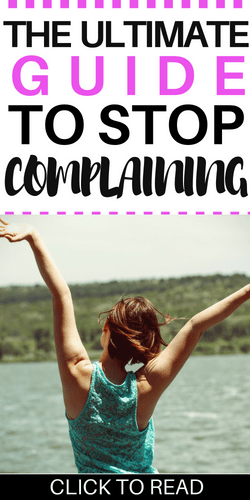 Gratitude has really helped me on my journey to stop being a complainer. When you’re complaining about what you don’t like about your life you’re taking for granted all of the blessings that you have. Start focusing on things you like about your life instead of dwelling on what you want to be different. I make a gratitude list of everything I love about my life every day in my journal and it helps me remember how blessed I am. It’s easy to have a great life and completely take it for granted. Becoming aware of all the blessings surrounding me has helped shift my energy from complaining to gratitude. 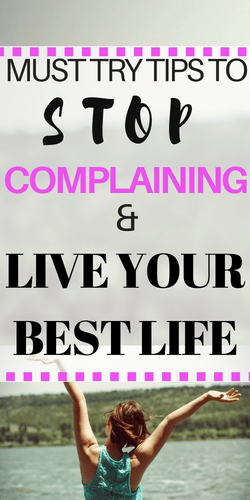 If you let your brain be flooded with negative thoughts it’s going to be really hard not to complain. One of the great things about being a human being is that we are self-aware and we can choose our thoughts. When you’re having negative thoughts stop yourself and choose to think about something that feels better. Say some affirmations or focus on what you’re thankful for instead. It takes a lot of energy to change your thought process at first but over time your brain will start to look for the positive and it will become easier. When I start to worry about the future and feel anxious I will tell myself “but things always work out for me in the end so I don’t need to worry”. That thought feels a lot better to me than worrying about things I can’t control. Find a thought that feels good to you and start using it to replace the negative thoughts that you have. I have been trying to flood my brain with positive material every day. If you have been having a lot of negative thoughts for a long time or if other people in your life are bringing you down you need to seek out positivity to compensate for that. I love listening to podcasts and audiobooks. You can find some of my favorite books that I have read here and I have a list of my favorite podcasts here. I have been on an intense journey to become a more positive person over the last year. Training my brain to quit focusing on the negative has made a huge difference in my mental health. I hope this will inspire you to start a positivity journey of your own. 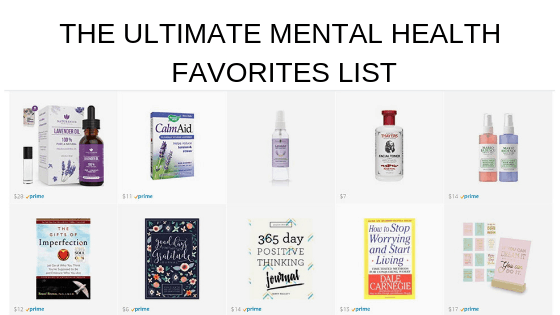 If you’re looking for more mental health resources I have a ton of posts on mental health and self-care and I would be thrilled if you checked them out. I also have an entire library of free printables and resources you can access here.